How does one write the perfect best man speech? You write it from scratch. You make it 100% personal. You don’t use a template or a sample from another wedding. A best man speech is a custom experience. We have writers who understand that a wedding is a special occasion, that all eyes will be on you, and that your job is not to shine for yourself, but to shine by how you honor the bride and especially the groom. Hiring our professional speechwriters will help you deliver a smoother, better appreciated Best Man Speech that guests will remember for all the right reasons. 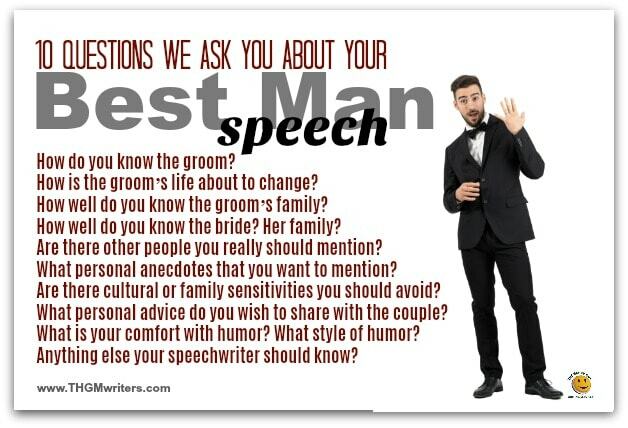 If you are unsure how to write the ideal speech for your role as best man, we can help you. Just fill in the form on this page and let us know all about the approaching wedding. 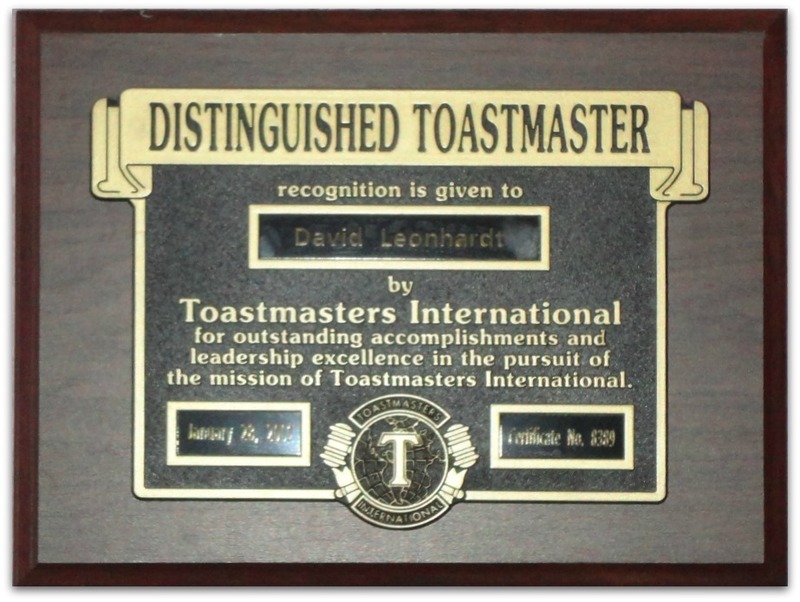 THGM President David Leonhardt received the “Distinguished Toastmaster” award – the highest recognition Toastmasters International bestows. Take advantage of David’s skills to create your ideal best man speech. Thanks for helping to organize my thoughts and put them on paper. … Thanks again for all your help. While I had an idea for what I wanted to express, your help in getting it structured was a big help. The conference overall exceeding even my expectations. Great energy, great value. You will have some fantastic words to say – both at your next speech, and when it’s over. People who rarely give speeches often need help when they are asked to speak at a wedding. Here are some of the top reasons we have heard from our clients over the years. Tap or click to read more reasons to hire a professional speech writer. What type of wedding speechwriter are you looking for? You hire a Best Man speech ghostwriter because you don’t know where to start. This might be the most common reason to hire a wedding speechwriter. You’ve never given a speech, and there is so much to talk about. But you can’t think of anything, or you just don’t know where to start. That’s not a problem. Give us the information we need, and we’ll know where to start. We have questions for you, as you will see below. Answer the questions, and we’ll get started on a custom wedding speech that is personal, authentic and as humorous or emotional as you want it to be. You hire a professional Best Man speechwriter because you don’t want a canned speech. You could just deliver a canned speech from the Internet. But that’s no way to honor the bride or the groom. Whether you are the best man or the maid of honor, you’ll want your moment in the spotlight to be a personal message to the people you love. When you hire a wedding speech ghostwriter, your speech is written from scratch. It’s personal and authentic, a moment the happy couple will treasure forever. You hire a professional wedding speechwriter because you are not comfortable with speaking. Most people are not all that comfortable speaking. It’s OK to be shy, but when you are asked to be the Best Man or the Maid-of-honor, you might not have a choice. And when you are the Father-of-the-groom or the Father-of-the-bride, it’s hard to decline a request to say a few words. When people are shy to speak, they are often also uncomfortable drafting their speech. That’s when hiring a wedding speechwriter makes sense. A strong Best Man speech or Father-of-the-bride speech gives you confidence to deliver the speech — to do the speaking. You hire a best man speechwriter because you are too close to the subject. Some people have a hard time talking about people they are close to, even themselves. Job interviews become challenging when the spotlight is on them. Best Man speeches and Father-of-the-groom speeches are challenges for the same reason. Why is it so easy to talk with friends about sports or recipes or the movie you saw last night, but so hard to find the words to speak about a person you care for? Hiring a wedding speech ghostwriter is a smart strategy to help find the right words, to choose what works well in a speech and what doesn’t. You hire a best man speech writer because you want to deliver the best speech possible. Not everybody is shy or struggling to find the words. Some people could actually draft a fairly good Best Man speech or Maid-of-honor speech. But they want better. They want an expert to help polish the words or build on their thoughts. We are happy to help. We can help. We love adding to the joy of a wedding. For a free quote on ghostwriting your Best Man speech or any other wedding speech, tap or click the red button to the right. Working with a wedding speech ghostwriter is pretty easy. You supply the information, they do all the work. You ask for revisions…and they do all the work again. Tap or click to read more on how to work with a wedding speech writer. Think about the qualities of the bride or groom. This speech is about the bride or groom…or both. It’s about who they are so far and who they will be in the future. This is a major life moment. It calls for a true look into what makes them who they are. That means values and personality. Everything we do is based on our values and personality, fundamental qualities that transcend events and moments. A good Best Man speech or Maid-of-honor speech will reflect those qualities. Think about the best stories about the bride or groom. What makes life interesting are those funny moments, or those moments of courage. These little stories cast a light on the bride or groom and help us know them better and relate to them better. One of the keys to working with a Best Man speechwriter is to dig deep for those stories. Never mind about how you word it; your ghostwriter will find the words for you. Decide how you want to handle humor. Humor is a tricky thing. Not everybody can pull it off. And not everybody can pull off all kinds of humor. Before you find a Best Man speechwriter, decide how you want to handle humor. We have some questions for you. The more completely you answer them, the better. Most people are very good at answering the questions about the people. But they often skimp on the anecdotes. Five or six anecdotes are best. That way, there surely will be two or three that fit nicely into the speech. Sometimes we’ll use more. How do you know the groom? How well do you know the groom’s family? How well do you know the bride? Her family? 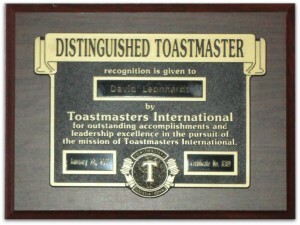 Are there other people you really should mention in the speech? What personal anecdotes that you really want to mention? How is the groom’s life about to change? Are there any cultural or family sensitivities you should avoid? What personal advice do you wish to share with the couple? What is your comfort level with humor? What style of humor? Anything else your speechwriter should know? For a free quote on ghostwriting your wedding speech, tap or click the red button to the right. Best writers for the best man – we are eager to help you deliver a truly praiseworthy speech. If you are looking for help with your best man speech, let us know about the wedding and your initial thoughts by sending us the the form on this page.